Do you know the difference between 'Closed Chain' exercises and 'Open Chain' exercises? Closed chain exercises are performed where there is a closed loop of contact with the ground (or other immobile surface), either with hands, feet, hand/foot, or some other part (like shoulders in a bridge exercise). Studies and opinion recommend closed-chain exercise for more efficient functional gains and quicker returns to activity. Most recently, a study reported more Minimally Clinically Important Changes (MCIC) in closed chain rehab of the shoulder. Looking to use your exercise time more effectively? Consider talking to your chiropractor about which closed-chain exercises may benefit you. Bynum EB, Barrack RL, Alexander AH. 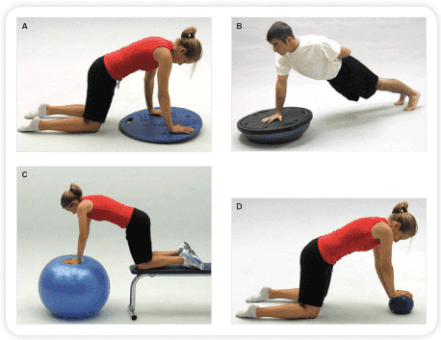 Open versus closed chain kinetic exercises after anterior cruciate ligament reconstruction. A prospective randomized study. Am J Sports Med. 1995 Aug;23(4):401–6. Uçar M, Koca I, Eroglu M, Eroglu S, Sarp U, Arik HO, et al. Evaluation of Open and Closed Kinetic Chain Exercises in Rehabilitation Following Anterior Cruciate Ligament Reconstruction. J Phys Ther Sci. 2014 Dec;26(12):1875–8.